It is more than 100 years since the earliest recorded international women's football match. That match was held in Belfast on Boxing Day 1917 when Tyneside Girls beat Irish Girls 4-1 at Grosvenor Park. It's a match consigned to, and it seems mostly forgotten by, the annals of the beautiful game. But a century on every effort is being made in the country that hosted that game to ensure female footballers reach their full potential. Women versus ladies football: Does the name matter? 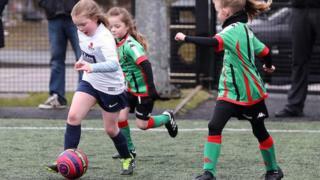 The Irish Football Association (IFA) says there are about 4,500 women and girls playing football regularly with clubs across Northern Ireland. International team manager Alfie Wylie says the traditional stereotypes and prejudices - that football is a game for boys and men - no longer apply. He said the game now has an infrastructure to allow the best players to flourish. "There has been fantastic development in the women's game over the last 17 years," he told BBC News NI. "The women's game is very much accepted now and the IFA has continued to lead and develop the women's game at all levels," he said. At senior international level, Northern Ireland notched up wins against Uzbekistan, Jordan and Kazakhstan to secure third place at the Alanya Gold City Women's Cup in Turkey earlier this month. Success on the field is testament to a focus on developing grassroots talent. Between 2000 and 2005, Northern Ireland did not have a senior international women's team. A series of heavy defeats saw the governing body switch its focus to developing a new generation of international players. It's at grassroots, in the spotting talent and developing potential where many resources are now placed. The next generation are coached within the Girl's Regional Excellence Programme that sees 220 girls train each week. A performance academy for elite young players, in partnership with Ulster University, is now also in place. There are now international teams at under 19, under 17 and both under 16 and 15. Northern Ireland's highest tier of domestic football boasts a seven team Women's Premiership with Linfield, Glentoran, Derry City, Cliftonville, Crusaders, Portadown and Sion Swifts competing for the title. Caoimhe McLaughlin has been with Derry City since she was 13 and is now both player and assistant manager. "I've been with the club nearly 17 years and the transition we've made over that time is massive," she told BBC Radio Foyle. "The girls coming in now at the age I started at have a completely different setup. They've got the best facilities and use of the Brandywell, they've got amazing coaches with proper qualifications," she said. She said when she set out as a young footballer there were no "school programmes in primary or secondary school level". "But now we're going into schools and coaching, whether in PE lessons or after school. "You can see the amount of girls coming in the door - we're unable to keep up with demand. At Derry City we've got more than 50 girls involved." The club - with a senior international and three under 19 international players in their ranks - have traditionally been known as Derry City Ladies. Now, 'Ladies' has been dropped from the club's moniker. It's further evidence of a growing confidence in the women's game, the club's assistant manager said. "The term 'Derry City Ladies', we felt, was outdated language. "We'll use the term 'Derry City Football Club Women' only to differentiate from the men's team," Caoimhe said.